Register for the full conference with the promo code DISCOUNT50, and $50 will be deducted from the price of your general admission ticket! Click image to go to conference page. 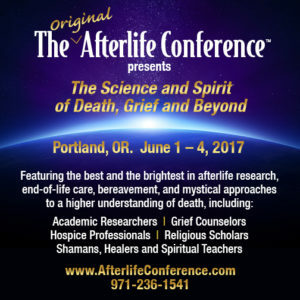 Join me at the 7th Annual Afterlife Conference in Portland June 1-4, 2017 (see image caption for a great $50 discount) where I’ll facilitate a May 31st opening night community discussion on the language we use: The Dilemma of Death & Language of Loss: A Conversation. Read on to meet the panelists who will get our May 31st conversation started: Karen Wyatt, MD, hospice physician and founder of End-of-Life University; William Peters, MFT, MEd, director of The Shared Crossing Project, a research initiative to examine the shared-death experience; and Austyn Wells, a spiritual medium who combines her certification in grief counseling with shamanism, energy medicine, and intuitive client interaction. Join us to consider these and other perspectives in small group discussion following opening remarks by these panelists. features the best and the brightest in end-of-life care, afterlife research, bereavement, and mystical perspectives on what happens after we die.